This is one amazing tetrahedron! The Geocaching Trifecta is a long standing tradition to those who visit us here in the Pacific Northwest, and it got a lot more relevant again in the summer of 2017. Attempting to complete the Trifecta is a popular goal of geocachers traveling to the Seattle/Portland area. The three geocaches considered as the Trifecta are and A.P.E. cache container, most commonly now (GC1169), the Original Stash Tribute Plaque (GCGV0P) and the Geocaching Headquarters (GCK25B). This coin has amazing detail and has a tribute to each stage of the trifecta, as well as the tracking information on one of the four sides. This makes a great gift, is an incredibly cool and unique geocoin, and also makes a great trackable paper weight! 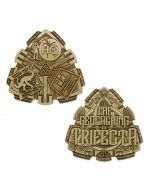 The Trifecta 3D Tetrahedron Geocoin was designed by Christian Mackey for Shop Geocaching. It has a bronze finish and is trackable at Geocaching.com with a unique icon. Measures approximately 2.25 inches tall.